My epic fantasy novel City of Rogues: Book I of The Kobalos Trilogy has shown up over at the Free Book Dude website, where you can find all kinds of free e-books. 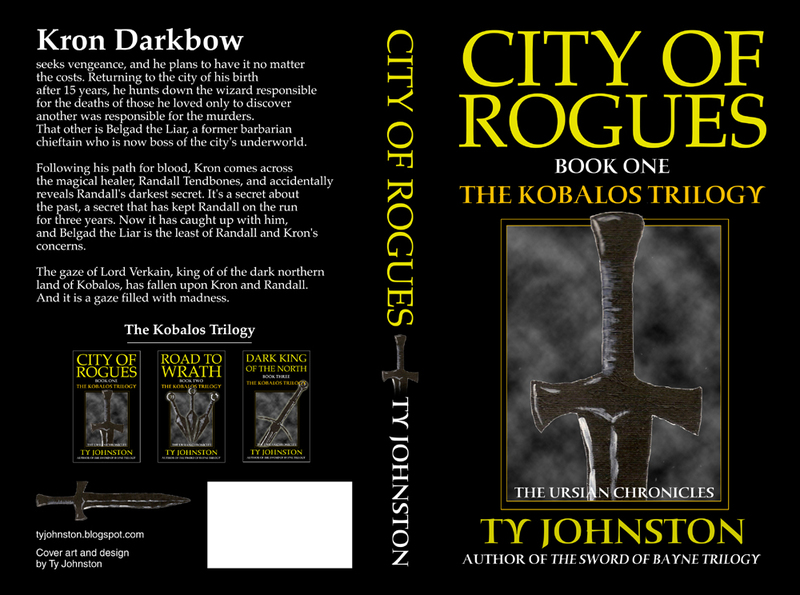 Oh, it could be because City of Rogues is currently free for the Kindle in order to celebrate the new print edition of the novel (which, sorry, isn't free ... at least not right now)! Notes: One of the more frustrating aspects for a writer making use of Amazon's KDP program to publish e-books is that Amazon provides the publishers with next to no information about who buys their books, who looks at the books' pages, etc. These are statistics that could be quite handy for writers and publishers, mainly because it might allow them to better market their books. 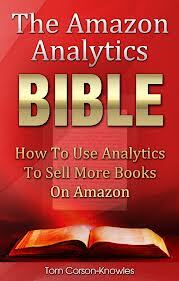 Well, this little e-book is supposed to show a way to gather such information, so I thought I would give it a try. Mini review: Yeah, I think I learned a few new tricks here. Not sure if they'll actually help sales, but I'll try them out and see how things go. Also got a reminder here of some marketing tools I hadn't been paying much attention to of late, so that was also nice. Notes: This is the second of this author's short e-books about the craft of writing. I enjoyed the first one so much, I had to check out the second. Mini review: One of the things I really like about this series is that it is very down to earth. You don't feel like you're being lectured to or that you're reading through some long, boring text book. No, this book is written more like you were sitting at a table with another writer, sharing a few beers while talking about the craft. I appreciate that, and find it rare in most books about writing. Here was a nice refresher on some things I mostly know, but don't think about because I take most of it for granted. The author here opened my mind up to some things concerning character I hadn't thought about in a while, and yep, it's got me thinking again. I'm already imagining some changes, things I might not ordinarily try, to my next writing project. Notes: Author and professor Charles Gramlich has put out a nifty little collection of short e-books concerning the craft at writing, and this is the first of those publications. As the title says, this one is about suspense and how a writer can build it within his or her fiction. Mini review: Actually, a fun read, and I learned a few new things. The author writes in plain but fun language that is easy enough to follow, and takes an interesting new approach to creating suspense in fiction. I'd never thought of the approach Gramlich uses, and this has given me a new way of thinking about suspense, one I'm itching to try. 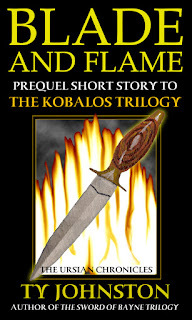 My short story Blade and Flame not only has a new cover, but it is now available as a printed book. For other writers who are interested, I realize releasing a short story as a book might seem unusual, but for me it is a matter of experimentation. At 11,000 words, the story runs exactly at 50 pages in a 5" X 8" paperback. At a price of $3.99, I don't expect to sell many, but that's the cheapest I could go and still make any profit at all (something like 26 cents, I believe). But the goal here isn't necessarily to make sales, though that would be nice. The goal here is to further my exposure, and this story's exposure, by having it available in the "Book" section at Amazon. The cover is all mine. The dagger is actually a painting in acrylics, and the flames (and the rest) were created in Photoshop. Not necessarily my best cover, but I don't think it's too shabby. For those interested, the story is also available for the Kindle at a price of only 99 cents, as well as being available for the Nook, at Smashwords, Sony, Kobo, Apple, etc. 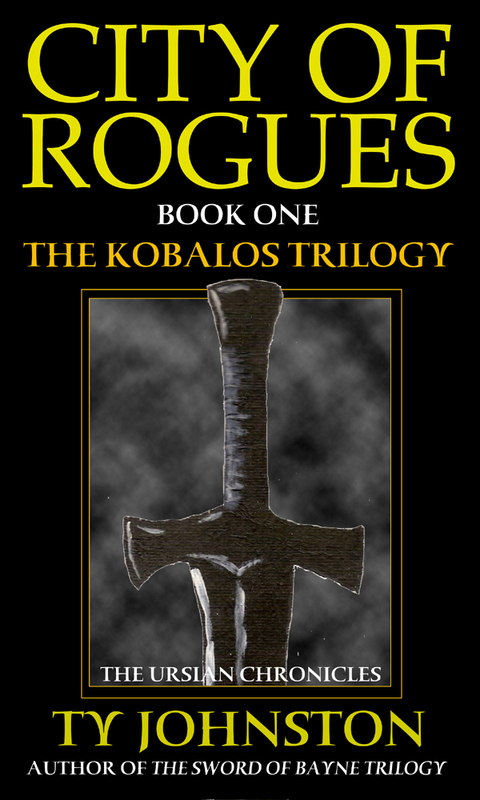 Writer Zackery Arbela has put up his review of my fantasy novel City of Rogues. 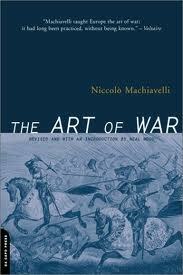 Notes: Yep, it's a third book titled The Art of War, this one by the famed Niccolo Machiavelli. There are actually two more books with this title of which I'm aware, one by Chairman Mao and the other by an 8th Century B.C. general from China, but I do not have those books. This book is of much interest to me for a variety of reasons, one being that it's another work of Machiavelli, but also that historically it's a little closer in its flare to what is often considered traditional fantasy warfare. I'm also interested here in the way this book is written, as a series of conversations, which is very Greek, in my opinion, but Machiavelli being a Renaissance writer, those writers were much influenced by the ancients. Mini review: Yes, there's definitely a strong influence from the ancients here. Nearly all of Machiavelli's notions behind the military sciences are based upon the ancient Romans, though some upon the Greeks and other early nations. It was interesting to compare this book with one of a similar title written by Baron de Jomini in the early 19th Century, to see how much had changed but also what had remained the same in the roughly 300 years since the publication of Machiavelli's work here. To add: Unlike most authors of such literature, Machiavelli wasn't an experienced military man. Machiavelli was mainly a bureaucrat who was also familiar with rounding up men for military service, and he spent time as a clerk of sorts for various military figures, but he was never a soldier or officer himself, nor do I believe he ever took part in actual combat (though my memory is a little shaky on that one). Still, armchair general or not, Machiavelli raises many good points in this book, and anyone interested in warfare, the Renaissance, or even fantasy war, could do themselves a favor by reading this. The writing is fair, not difficult to understand, and there are a few charts to help with the more difficult parts. 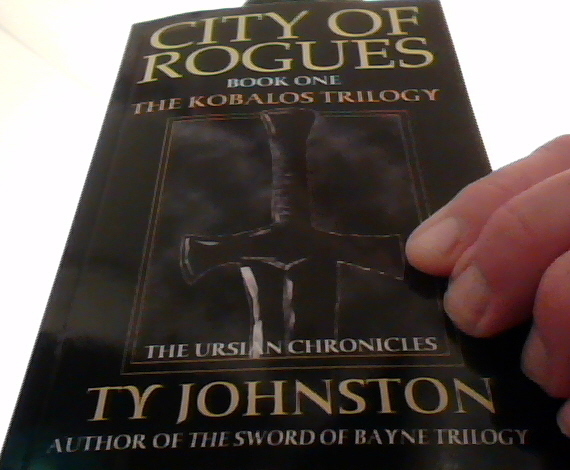 The epic fantasy novel City of Rogues: Book I of the Kobalos Trilogy is now available in print from Amazon for $8.99. Books II and III should be available in print later this year, as well as the prequel short story, Blade and Flame. Also, a map of the continent of Ursia is included in City of Rogues, and will be in each of the Kobalos books. I'm hoping this year to have out more print products, as well as some new, improved covers. So far 2013 is looking good on that front, but we'll see how things go. Notes: No, this is not a translation of the more famous book of the same title, that written by Sun Tzu, which I recently finished reading. This is an entirely different book, first published in the early 1860s. The author was Russian, and this work has gone down in history as one of the most noted, if not most important, written works on Napoleanic warfare (which, in my opinion, was slowly going out of military fashion about the time of publication, mainly because of the increase in deadliness of the weapons). Of the translator, I could learn little, other than he was a captain who served in the U.S. army engineers in the U.S. Civil War. I'm interested in this book for its history, of course, and how historic warfare relates to fantasy literature, but I'm also interested here because this book was published only a few decades before Tolstoy's book about non-violence. As a member of the nobility himself, Tolstoy would have been aware of the Baron de Jomini, who was a fairly famous person in Russia at the time. Tolstoy also likely would have been aware of this work, though whether he read it or not is anyone's guess. Mini review: Not the most exciting of reads, but not completely boring, and very interesting. Also, for the time period, this book is fairly technical, but goes back and forth between being vague on some subjects while being more detailed on others. Any writer interested in working in the era of Napoleon should read this, especially if planning to write about warfare from about 1750 through about 1850. And while the edition I read was an English translation from 1863, the original book came out in the 1830s. Besides the original book, the translation I read had several later additions by the author, going up to the 1850s. Also, the author was no armchair historian, but a military man who had been in a dozen of the battles he write about here. This book throws about a lot of names of people and places which might not be familiar to the average person, but thankfully I knew enough of history that I could feel my way around or could look something up. I've not done a quotes listing in a while, and recent readings had some good ones. The following quotes come from Leo Tolstoy's The Kingdom of God is Within You, which I just finished reading. I don't necessarily agree with all of Tolstoy's opinions, but I found these particular quotes interesting.
" ... the Church is holy; the Church was founded by Christ. God could not leave men to interpret his teaching at random -- therefore he founded the Church. ... those statements are so utterly untrue and unfounded that one is ashamed to refute them. Nowhere nor in anything, except in the assertion of the Church, can we find that God or Christ founded anything like what Churchmen understand by the Church. In the Gospels there is a warning against the Church, as it is an external authority, a warning most clear and obvious in the passage where it is said that Christ's followers should 'call no man master.' But nowhere is anything said of the foundation of what Churchmen call the Church." "The follower of Christ, whose service means an evergrowing, understanding of his teaching, an ever-close fulfillment of it, in progress toward perfection, cannot, just because he is a follower of Christ, claim for himself or any other that he understands Christ's teaching fully and fulfills it." " ... to assert of one's self or of anybody of men, that one is or they are in possession of perfect understanding and fulfillment of Christ's word, is to renounce the very spirit of Christ's teaching." "The churches as churches are not, as many people suppose, institutions which have Christian principles for their basis ... The churches as churches, as bodies which assert their own infallibility, are institutions opposed to Christianity. There is not only nothing in common between the churches as such and Christianity, except the name, but they represent two principles fundamentally opposed and antagonistic to one another. One represents pride, violence, self-assertion, stagnation, and death; the other, meekness, penitence, humility, progress, and life." " ... the churches have never served as mediators between men and God. Such mediation is not wanted, and was directly forbidden by Christ, who has revealed his teaching directly and immediately to each man. But the churches set up dead forms in the place of God, and far from revealing God, they obscure him from men's sight." "All that they preach is an external observance of the rites of idolatry." "The man who has been instructed by the Church in the profane doctrine that a man cannot be saved by his own powers, but that there is another means of salvation, will infallibly rely upon this means and not on his own powers, which, they assure him, it is sinful to trust in." "If a man can be saved by the redemption, by sacraments, and by prayer, then he does not need good works." "If a man sincerely believes in the Sermon on the Mount, the Nicene Creed must inevitably lose all meaning and significance for him ..."
"This, then, is the work of the churches: to instill a false interpretation of Christ's teaching into men, and to prevent a true interpretation of it for the majority of so-called believers." " ... however men may try to conceal it, one of the first conditions of Christian life is love, not in words but in deeds." " ... we all know how our laws are made. We have all been behind the scenes, we know that they are the product of covetousness, trickery, and party struggles; that there is not and cannot be any real justice in them." "People are astonished that every year there are sixty thousand cases of suicide in Europe ... but one ought rather to be surprised that there are so few. Every man of the present day, if we go deep enough into the contradiction between his conscience and his life, is in a state of despair. ... Not to speak of all the other contradictions between modern life and the conscience, the permanently armed condition of Europe together with its profession of Christianity is alone enough to drive any man to despair, to doubt of the sanity of mankind ... This contradiction ... is so terrible that to live and to take part in it is only possible if one does not think of it at -- if one is able to forget it." " ... tomorrow some crazy ruler will say some stupidity, and another will answer in the same spirit, and then I must go expose myself to being murdered, and murder men -- who have done me no harm ..."
"The basis of authority is bodily violence." "All the methods of appointing authorities that have been tried, divine right, and election, and heredity, and balloting, and assemblies and parliaments and senate -- have all proved ineffectual." "Rulers always try to implicate as many citizens as possible in all the crimes committed in their support." " ... while in former days a man who professed the religion of the Church could take part in all the crimes of the state, and profit by them, and still regard himself as free from any taint of sin ... nowadays all who do not believe in the Christianity of the Church, find similar well-founded irrefutable reasons in science for regarding themselves as blameless and even highly moral ..."
"A single fortune gained ... by any employment which trades on men's evil instincts ... corrupts men incomparably more than millions of thefts and robberies ..."
"... the hypocrisy of our society far surpasses the comparatively innocent hypocrisy of the Pharisees." "Hypocrisy in our day is supported on two sides: by false religion and false science." "A man cannot be placed against his will in a situation opposed to his conscience." Notes: Having just finished reading Tolstoy major work on pacifism, now I go in the completely opposite direction. Over the years I have read bits and pieces of Sun Tzu's famous work on war, but I've never sat down to read the whole thing. My impression has been that this work is more philosophical than technical, and now I'll find out. Mini review: Somewhat philosophical in places, but less so than I had expected. For the most part, much of this sounded like plain common sense to me. Not that I'm any military genius or anything, but maybe I've read enough to know at least some common sense military strategies. That being said, I did pick up a few new things here, mainly about using the landscape and the reactions of wild animals to be able to find information about an enemy's location and movements. For example, Sun Tzu suggests watching birds in flight as they land, for the birds will not land where an army is encamped; this seems fairly plain and makes sense, but it's not something I'd ever thought about before.